26 Commercial Real Estate & Properties in Forest Glen are listed in 2 categories. We have 25 Industrial Warehouses Sale & Lease and 1 Development LandsSale & Lease . 1,500 m2 high clearance warehouse 2 x electric container height roller doors 3 phase power available Large car park Great access Call The Commercial Guys today to book your inspection or for further information. Unless otherwise stated, the price/property may be subject to GST and/or outgoings. Brand new available now! 750 m2 high clearance warehouse 2 x electric container height roller doors 3 phase power available Large car park Great access Call The Commercial Guys today to book your inspection or for further information. Unless otherwise stated, the price/property may be subject to GST and/or outgoings. New warehouse ideal for a wide range of uses 350 m2 high clearance warehouse Electric container height roller door 3 phase power available Large car park Great access Available now Call The Commercial Guys today to book your inspection or for further information. Unless otherwise stated, the price/property may be subject to GST and/or outgoings. 400 m2 high clearance warehouse Electric container height roller door 3 phase power available Large car park Great access Available now Call The Commercial Guys today to book your inspection or for further information. Unless otherwise stated, the price/property may be subject to GST and/or outgoings. Large Brand New Freestander Contact Agent For Latest ..
Large open plan tilt panel constructed warehouse Sizes ranging from 500m2 to 3,662m2 2 x 8m wide electric roller doors 3 x container height electric roller doors 2 x container height roller doors on the side for ventilation 3 phase power Toilet amenities Newly built Ability to drive trucks through warehouse Potential to take the whole lot or split Large car park Easy access Multiple fit out options Suitable for Logistics Business Call The Commercial Guys today to book your inspection or for further information. Unless otherwise stated, the price/property may be subject to GST and/or outgoings. New Warehouse Or Storage Facility From $55,000pa + outgoing..
New warehouse or storage facilities ranging from 500sq m to 3,662sq m (approx) ideal for small to medium warehouse or to a large distribution facility. This location is within moments to the Bruce Highway, Maroochydore Road and approximately 30 40 minutes to any commercial hub on the Sunshine Coast and directly accessible to the great South East Queensland region. + High clearance warehouses ranging from 500sq m (approx) + Container height roller doors + Ample concrete hardstand and car parking areas + Drive around and drive through access + Three driveways + Gas supply and grease trap ideal for food manufacture This is a rare opportunity to secure a fully constructed building of this capacity on the Sunshine Coast. Call or email David Smith or Matthew Marenko to inspect the property or find out about other suitable options. Our team is strategically located in two offices across the Sunshine Coast region and is ready to handle your commercial, industrial and retail property needs today so call or email now. 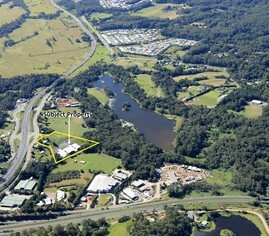 Quality built industrial facility of 732sq m (approx) within moments to the Bruce Highway and Maroochydore Road. This location is approximately 30 to 40 minutes to any commercial hub on the Sunshine Coast and directly accessible to the great South East Queensland Region. + High clearance warehouse with a total area of 732sq m (approx) + Two container height roller doors + Ample concrete hardstand and car parking areas + Truck access, both drive round and drive through + Three driveways + Gas supply and grease trap ideal for food manufacture This is a rare opportunity to secure a fully constructed building of this capacity on the Sunshine Coast. Call or email David Smith or Matthew Marenko to inspect the property or to find out about other suitable options. Our team is strategically located in two offices across the Sunshine Coast region and is ready to handle your commercial, industrial and retail property needs today so call or email now. 7172 Bruce Highway offers a variety of industrial sheds for lease, offering insulated roofs with Sancell Thermal Break Bubble wrap insulation. Complete with a 3 metre awning around the entire building to offer shade and weather protection and the lowest point of the roof sitting at 7.65 metres, the uses for the premise are versatile. There is also an abundance of parking with the parking council requirements plus and an additional 40 parks available. With a prime position allowing easy access to the Bruce Highway and easy semi trailer access around the whole building, and only moments to the Forest Glen Shopping Village this is a great opportunity. Please contact our marketing agents to discuss further or to arrange an inspection. New Warehouse Or Distribution Facility Just Off The Bruce Highway $402,820pa + outgoings + .. Magnificent new industrial facility of 3,662sq m (approx) ideally located just off the Bruce Highway and Maroochydore Road. This location is approximately 30 to 40 minutes to any commercial hub on the Sunshine Coast and directly accessible to the great South East Queensland region. + High clearance warehouse with a total area of 3,662sq m (approx) + Seven container height roller doors + Ample concrete hard stand and car parking areas + Excellent truck access + Three driveways This is a rare opportunity to secure a fully constructed building of this capacity on the Sunshine Coast. Call or email David Smith or Matthew Marenko to inspect the property or to find out about other suitable options. Our team is strategically located in two offices across the Sunshine Coast region and is ready to handle your commercial, industrial and retail property needs today so call or email now. + 65sq m (approx) unit with large roller door access + Individually metered power and water, kitchenette and bathroom, data points + Insulated 7.65 metre high roof and 3 metre awning (sizes approx) + Easy truck access and turn around + External security cameras + Ample on site parking Call or email Kenny Knight or David Smith to inspect the property or find out about other suitable options. Our team is strategically located in two offices across the Sunshine Coast region and is ready to handle your commercial, industrial and retail property needs today so call or email now. 7172 Bruce Highway offers a variety of industrial sheds for lease, offering insulated roofs with Sancell Thermal Break Bubble wrap insulation. Complete with a 3 metre awning around the entire building to offer shade and weather protection and the lowest point of the roof sitting at 7.65 metres, the uses for the premise are versatile. There is also an abundance of parking with the parking council requirements plus and an additional 40 parks available. With a prime position allowing easy access to the Bruce Highway and easy semi trailer access around the whole building, and only moments to the Forest Glen Shopping Village this is a great opportunity. Please contact our marketing agent Emily Pendleton on 0402 435 446 to discuss further or to arrange an inspection. 164m2 Industrial Premise For Lease | Forest Glen $21,320 P/A + Outgoings +..
Warehousing On The Bruce Highway Forest Glen $18,460 p.a. + Outgoings ..
New, stylish and easy accessible warehousing via the Bruce Highway in close proximity to the BP service station, news agency and Cafes. Ideal for courier businesses, transport or freight companies. NLA area: 142m2 Floor area: 120m2 Mezzanine area: 22m2 Outgoings: $1,420 $2,130 p.a. 3 Phase power Front sliding door access 6m High roller door Toilet facilities Kitchenette Insulated 8m high ceiling Easy access via the Bruce Highway For Lease: $18,460 p.a. + Outgoings + GST For more information or to arrange an inspection please contact Marketing Agents: Luca Reynolds 0422 777 074 luca.reynolds@raywhite.com Dave Tyson 0427 146 327 dave.tyson@raywhite.com Approx. Warehousing On The Bruce Highway - Price Reduction! $50,600 p.a. + Outgoings ..
Building Sizes Building 1: 3,851m2 Building 2: 3,031m2 + 168m2 Mezzanine As a Whole: 7,050m2 Both buildings can be split into tenancies starting from 200m2 Zoning: Low Impact Industry Owner will accommodate build to required sizes Located only seconds to the Bruce Highway Drive in/ Drive out Truck Access Within minutes to Kunda Park and central Sunshine Coast Pre commit now to secure a spot For Lease: $110 per square metre per annum + Outgoings + GST approximately Contact our Marketing agents for further information. Warehousing On The Bruce Highway Forest Glen $19,240 p.a. + Outgoings ..
New, stylish and easy accessible warehousing via the Bruce Highway in close proximity to the BP service station. Ideal for Courier businesses, transport or freight companies. NLA area: 148m2 Floor area: 124m2 Mezzanine area: 24m2 Front Sliding door access Outgoings: $1,480 $2,220 p.a. 6m High roller door Toilet facilities Kitchenette Insulated 8m high ceiling Easy access via the Bruce Hwy For Lease: $19,240 p.a. + Outgoings + GST For more information or to arrange an inspection please contact Marketing Agents: Luca Reynolds 0422 777 074 luca.reynolds@raywhite.com Dave Tyson 0427 146 327 dave.tyson@raywhite.com Approx.